I have a soft spot for a beautifully wrapped gift. One problem with being frugal is that I feel guilty if I spend $5 on the paper and embellishments that could have gone towards the gift itself. Especially since those things usually end up in the trash. In the past I have purchased wrapping paper mostly from school fundraisers. In my experience, it is a good quality, I can support the cause and it worked out well enough. My main frustration was that I always seemed to run out of the one paper I needed right when I needed it. No more boy birthday paper during a run of parties, oops, ran out of Christmas paper three days before Christmas – that sort of thing. 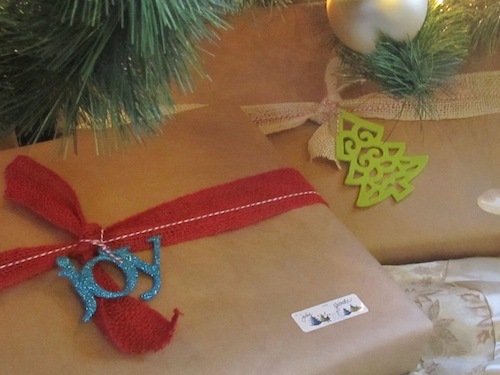 After seeing some lovely wrapping ideas, I have moved on to simplified gift wrap – kraft paper! This stuff is great – it is in expensive (I bought 37 1/2 square feet at Office Max yesterday for $3.99, but I have purchased larger rolls for less per square foot at Target (Target was out, note to self: stock up BEFORE the holiday shipping season). Heck – you can get a HUGE roll of the stuff for about $30. But, then you might need a dispenser and a place to put it. I am working on that (seriously – I am). Local paper supply places carry the rolls, which will save on shipping such a heavy package. Back to the gift wrap. It is fantastic! I just use the base kraft paper and then embellish away. I have been stocking up on cool ribbons and materials as I see them. Some of my finds have been at Costco, through Pick Your Plum, after season clearance sales and the dollar store. Things I have squirreled away are baker’s twine (colored), ribbons, bows, jute material, inexpensive ornaments (10 for $1), miscellaneous craft materials (bells, sprigs of berries) and fun add ons like buttons and tags. I have picked up all sorts of colors, so we can make the gift appropriate to the occasion (think babies, weddings, boy birthdays, girl birthdays, holidays, and the like). Your kids can draw on it, you can draw a fancy word of picture, you could stamp on it – it is so versatile. One word of warning – kraft paper tends to be stiff (it is thick), so I have found that creasing it a bit helps it stay put. And, I have used a bit more tape to secure the wrap, particularly on the sides of the package where the wrap is folded more. What I do love is that I always have the right wrapping paper on hand! In the past two months I have wrapped baby gifts, a wedding gift, birthday presents, an anniversary present and Christmas gifts with it. The beauty of the kraft paper is that it is rustic, so you can take the most humble materials and make it look so charming. During this time of year, you could even adding an evergreen cutting before you gift it – how sweet! 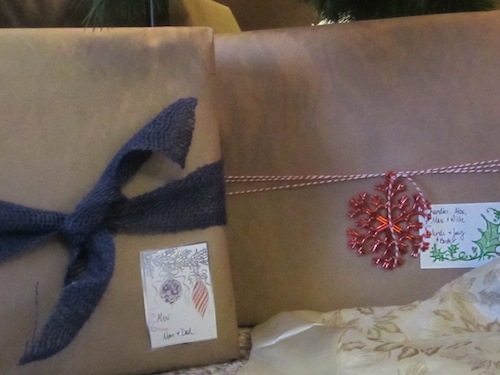 With the holidays season shifting into full gear, I have so enjoyed wrapping up my gifts. And, since they sit under our tree all season, we have had the pleasure of enjoying their beauty before they make their way to their recipients. So pretty! I like the kraft paper because it’s recyclable. In my area they don’t accept traditional wrapping paper due to a coating that makes the finish shiny. Great post! A few years ago I stamped my kids hands/feet in paint and used their prints to decorate kraft paper. At school they’ve also stamped paint dipped cookie cutters onto solid paper to create colorful designs. I keep vowing to myself that I will use kraft paper again to wrap gifts as soon as I run out of other papers…but then after Thanksgiving I caved and bought more gift wrap. 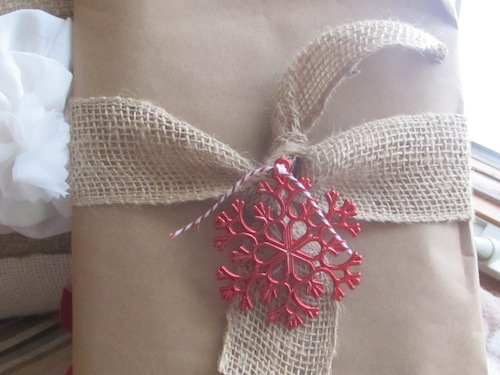 But after seeing how beautifully you’ve embellished your gifts I think I’m ready to keep my vow of giving kraft paper a chance for all the reasons you’ve mentioned. Thanks for the inspiration. Oh, great idea to use hand prints or foot prints! You could also make cute reindeer by making the head and body out of finger prints and adding antlers and a red nose. I love wrapping with craft paper. Although I must admit, your pics look far lovelier than my jobs. :) We’ve been picking craft paper up at the dollar store lately. What a great money saver, and you are so right, you literally can have any occasion taken care of with craft paper. :) Thank you for sharing. I like to use cloth for family gifts, but I hate to give up my cloth bags and squares for ‘outside’ gifts–this would be perfect, and pretty. Now to brave the after-Christmas sales!